Madden NFL 15 isn't a dramatic leap forward for the series, but it shows signs of evolution and attention to detail as we head into the new generation of consoles. 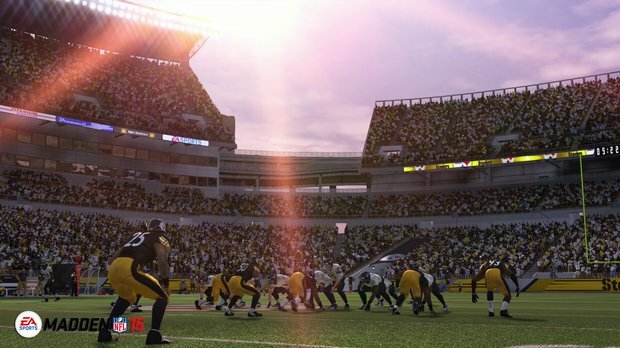 Over the years, EA Sports' Madden NFL franchise has faced its fair share of criticism. Let's be honest: most of it was deserved, as EA Tiburon seemed to be relying on certain patterns a bit too often, like using similar player models and stagnating action off the field. Connected Franchise was a nice change to the series, but more was needed, especially when new consoles are concerned. After all, we want a new football experience to go with our new machines, right? 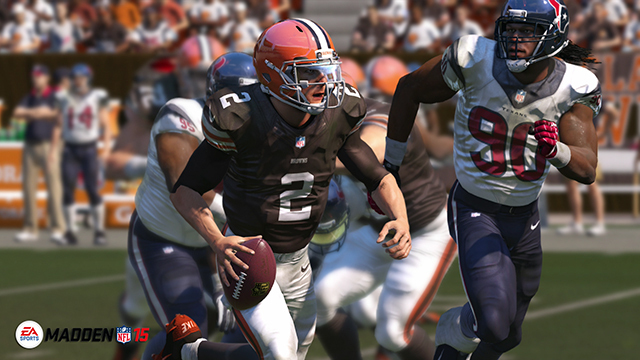 Enter Madden NFL 15. While hardly the most dynamic football game ever made, it does show signs of progress, an indication that EA Tiburon is listening to the large Madden fanbase. It still has its fair share of problems and glitches to contend with, but overall, this is a much more fluid game that we've gotten over the past few years, and could lead to a bigger run down the road. Perhaps the biggest indication that things have changed is within the small details. The tackling system has undergone tweaks with a new cone system, where you can actually direct your powerhouse tackles at those with the ball, ensuring a possible better opportunity at a fumble or, at the very least, a stoppage in yards. You also have more options to break out of tackles on the defensive line. If you're in a tussle with a player, you can tap a button to attempt to slip out to get to your target, although it's not always a success. It's like the real game itself, where momentum is everything, and makes for satisfying sacks when it works. The quarterback has more options as well, such as being able to kill time on the clock and more dynamically hustle away to get a pass off. That doesn't always guarantee victory, though. Sometimes you're still easy prey for a tackle, and other times, the defense reads passes all too well, setting up the opportunity for a key interception. I learned this the hard way with Madden's opening scenario, where the Seahawks pummeled the Panthers on a last-second drive. While the gameplay is more solid on the fundamentals, it's not without flaws. The AI can be a bit tricky on the defensive side, even if it's someone on a lower level like, say, the Raiders. It also has glitches galore, with players awkwardly hitting the ground and even passing through objects on the sideline. They're bound to get patched up with an update, but it seems this series could still use a slight bit of clean-up before moving forward. 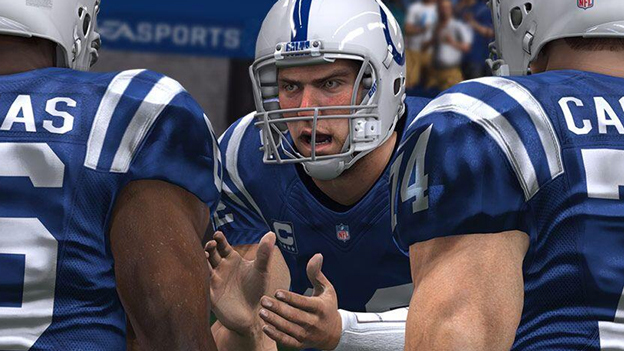 Glitching aside, Madden NFL 15 has never looked better. The on-field action looks more realistic than ever before, thanks to a better view of the action that's happening down-field, and authentically recreated stadiums, complete with crowds that actually look like crowds. It is weighed down a little bit in the commentary department, as Jim Nantz and Phil Sims can't quite keep up with Madden and Pat Summerall from the good ol' days. At least the sound effects are good enough to keep you distracted, with lots of grunts and cheers. Football! Other modes within the game remain largely untouched, but they're certainly functional, despite one minor setback. First up is Ultimate Team, where you can once again collect player cards and create your own customized team to pit against others. This is still a wonderful mode, as you can unlock new packs and other goodies simply by completing actions in the game. It never hurts to have this aspect of Madden intact. Connected Franchise mode also returns with a few changes, including the ability to set up a Game Plan, in which you help improve a player's Confidence (and in thus, performance) to make them better on the field. Doing so will net you rewards, including XP and better player attributes, which you can apply to different parts of the mode. It's very in-depth, and pretty cool for those who like to get the most out of their football experience. As I stated, though, it comes with a downside, and that's the interface. It feels clunky, especially when you're trying to make key selections and tap on something else. EA Sports would be smart to clean this up with a patch as well, just to assure players suffer less frustration. Online action also returns to Madden, and the few games I played ran without a hitch, although the public servers haven't been activated yet. There's bound to be a heap of traffic with the game's day one release, but so far, it runs swimmingly on both Xbox One and PlayStation 4, with very few hiccups. Finally, you'll want to give Skills Trainer a try. This will help you perfect the new techniques introduced in the game, as well as generally improve your offensive and defensive game. Plus, you'll earn XP, and that never really gets tiring, especially for you Ultimate Team collectors. Madden NFL 15 doesn't quite define what a next-gen football experience should be just yet, as certain setbacks keep it from being a Super Bowl champ. However, we are seeing signs of evolution, and that's a big step forward for the franchise. EA Tiburon could be onto something, and if it continues to listen to fan feedback , we could be in for some glorious days of video game football yet. For now, this is definitely worth checking out, as it's far from the same old thing. This impression is based on a PlayStation 4 and Xbox One review copy provided by the publisher. Madden NFL 15 will be available this Tuesday for Xbox One, Xbox 360, PlayStation 3 and PlayStation 4. It is rated E10. Robert Workman posted a new article, Review: Madden NFL 15: forward progress. I hate to be a complainer, but aside from the last paragraph and one or two blurbs above, this reads more like an overview of back of the box bullet points. I've been really looking forward to Madden reviews and hoping to get something more in depth. There is no mention at all about the game's presentation or things like load times in menus or during franchise mode front-end simulation (this was so bad in the recent last gen versions that I simply could not force myself to do GM simulation, which has traditionally been the part of Madden I spend the most time with). You mention that the AI is glitchy and the example given is that defense is a bit "tricky". Does this mean the AI unrealistically responds to the ball or are they playing more like human defenders? What difficulty was the game reviewed at and were their any experiments with the AI sliders? Do running backs still get hung up on lineman when going through the hole? I know this reads like I'm complaining about everything, but the review feels so generic that if you told me it was an E3 write-up, I wouldn't know the difference. It's not meant to be a promotional read. It's meant to cover the new content that's featured in the game. As a fan of the series this piece tells me nothing of what I want to know about this years version.